“White Bathing Beach Will Be Dismantled,” Histories of the National Mall, accessed April 23, 2019, http://mallhistory.org/items/show/185. 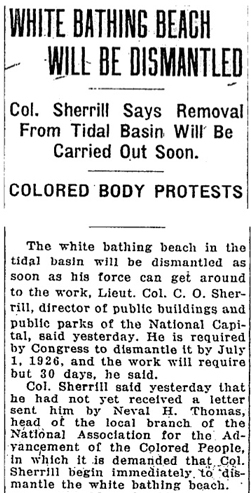 In February 1925, the Senate voted to defund and demolish the white and black bathing beaches at the Tidal Basin. Black residents were critical of the unequal funding and facilities at their beach when compared with the white one. In addition, physicians were concerned that the water in the basin was increasingly polluted and not safe for swimming. The white bathing beach in the tidal basin will be dismantled as soon as his force can get around to the work, Lieut. Col. C. O. Sherrill, director of public buildings and public parks of the National Capital, said yesterday. He is required by Congress to dismantle it by July 1, 1926, and the work will require by 30 days, he said. Col. Sherrill said yesterday that he had not yet received a letter sent him by Neval H. Thomas, head of the local branch of the National Association for the Advancement of the Colored People, in which it is demanded that Col. Sherrill begin immediately to dismantle the white bathing beach. "I withheld the work of dismantling the white bathing beach when the talk of reopening it arose," Col. Sherrill said. "But now that it is settled that it will not be reopened I will tear it down. However, there is no hurry as it will require but 30 days and by congressional action must be accomplished only by July 1, 1926." In his letter Thomas told Col. Sherrill that his organization would demand a congressional investigation of the dismantling of the colored beach on the west side of the tidal basin. "As the colored people expected all through the long controversy over the local bathing beach," he writes, "(since a segregated beach has been forced upon them) you have found a novel way of defeating the plain word and unmistakable intent of Congress ordering both beaches dismantled."